I love Charlotte Street. About 14 months ago, I bought a warehouse at 11 Charlotte Street, off King Street West, east of Spadina. Years ago, I sold 36 Charlotte (Charlotte Lofts) for Urban Capital. It was very hard to sell condos in 1999. With just 60 condos in the building, it took me about a year and a half to sell 45 units so the developer could build it. In 1999, very little was going on in this area. It was surrounded by parking lots and unattended warehouses; it was a different time. 36 Charlotte was my fifth new development that I sold as a developer’s broker. I bought 3 units in the building to help Urban capital get their financing. When I sold those 3 units in 2002, I made about a $320,000 profit. I spent a lot of time in this area in 1999 as I personally manned the small sales centre on most occasions. While I was selling the Charlotte Lofts, I kept looking at the parking lot directly to the south. I tried very hard to get Urban Capital to buy that property, to no avail. The two principles did not think it was a good site for a project. I bided my time and with profits earned from selling my three units at the Charlotte Lofts, plus some other money, in 2004 I bought that parking lot. Much to my surprise, it had sat unsold, I couldn’t believe my luck. Glas now sits on that parking lot. 25 Oxley Street was developed – 16 stories with 163 units, over the period of 2004- 2008. I love the way the 16-storey building fits into its midblock site. It’s not showy; it’s clean, elegant, and modern. So when I got the call that 11 Charlotte could be bought, I took some of my profits from the development at Glas and I made an offer. Unfortunately, a huge REIT was also interested and bid against me. I was so sure about Charlotte Street and this area I made a cash offer with no conditions. I bought the building, engaged architectsAlliance and ii x iv Interior Design and re-zoned the small property to house a 32-storey, 232 unit, ultra modern tower on the site. The project is known as The King Charlotte, so named for the nearby intersection. plans vary from 1, 2, and 3 bedrooms. Interior design firm ii x iv has designed the interior to be nothing short of spectacular, where no upgrades are needed. Standard finishes are amazing and include: 9 foot ceilings, double thick stone countertops, European cabinetry, exotic engineered hardwood flooring throughout, 6 foot deep balconies, 4 stainless steel appliances, gas cooking in the kitchen, gas nozzles on all balconies for year-round barbequing, spa-like bathrooms featuring stone tiles, spa bath tubs, fully tiled tub skirts, and high design faucets, to name just a few. Additionally, the common elements are on the same level of a very high end project. Execution is everything, so the top of the building houses the Skylounge, with an incredible 33rd floor outdoor pool and lounge with a stunning entertainment light box facility. I couldn’t be more excited about what we’ve done. 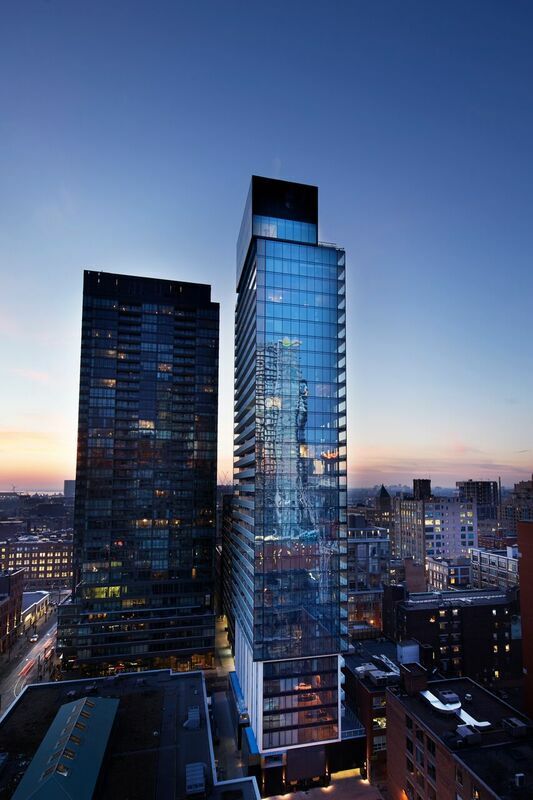 Sure to be an icon and hotly in demand to buy or lease, 11 Charlotte is now 65% sold out. With a date in late May when the shovel hits the ground, two bedrooms can be bought for just $508,900 and three bedrooms for just $579,900. Check it out while you can – our sales office is located on site at 11 Charlotte, or visit www.kingcharlotte.com.